On 29 May 1914 the Empress of Ireland collided with another ship in the St. Lawrence River. It sank with 1,477 passengers on board. It sank in less than 15 minutes and an estimated 1,032 people died. 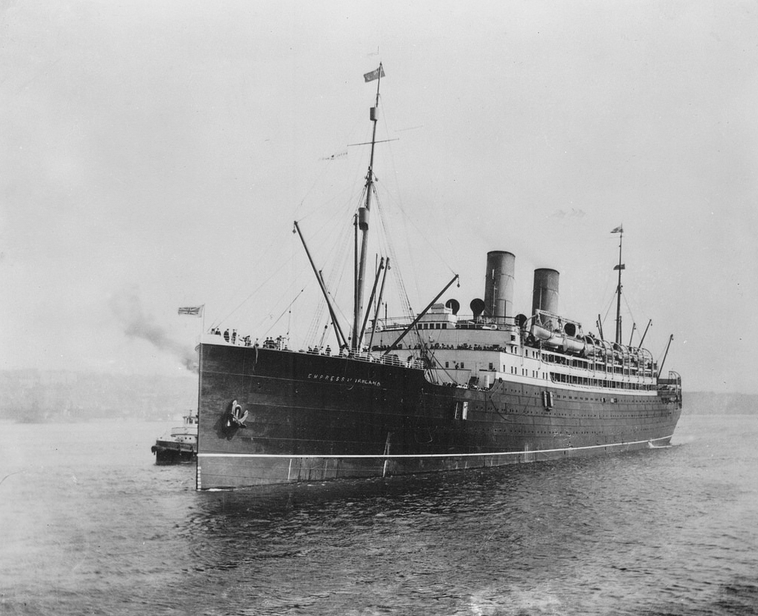 See a partial passenger list and photos at Empress of Ireland - Canada's Titantic. Previously I talked about the history of Loyalists in Part 1, Land Grants and Requirements for Loyalist Status in Part 2, Land Petitions in Part 3 and Land Records in Part 4 and Loyalist Lists in Part 5. 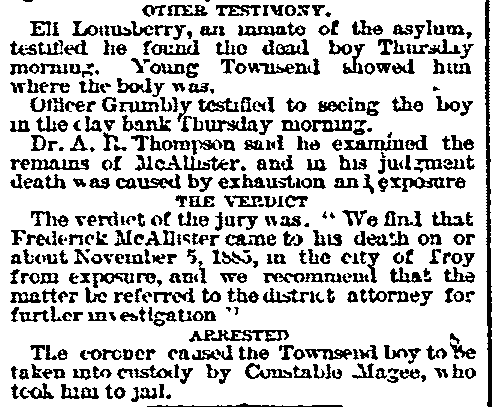 Now I want to walk you through finding an ancestor on the challenging set of records called The Haldimand Papers. These important papers were kept by Sir Frederick Haldimand, 1718-1791. The papers document events in North America beginning with the Seven Years War and ending with the settlement by Loyalists after the American Revolutionary War. 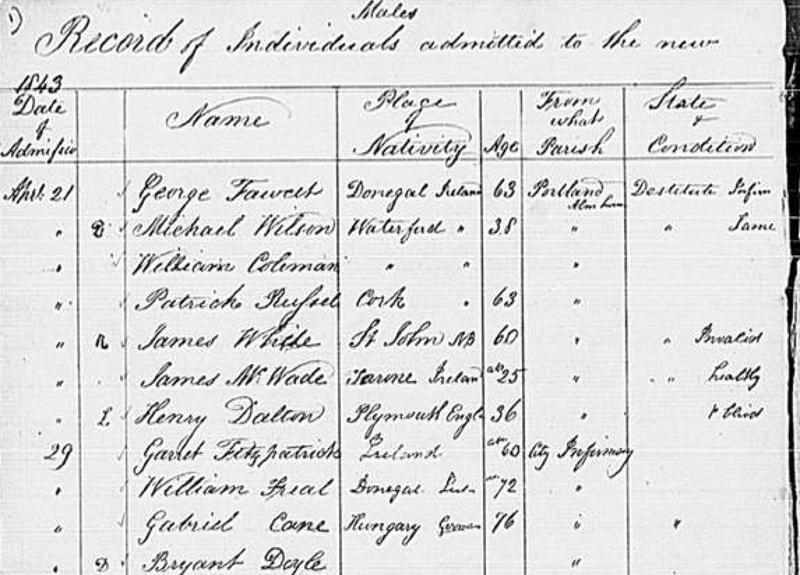 Finding an ancestor in the digitized records is a challenge but it can be done and the wealth of information is incredible. 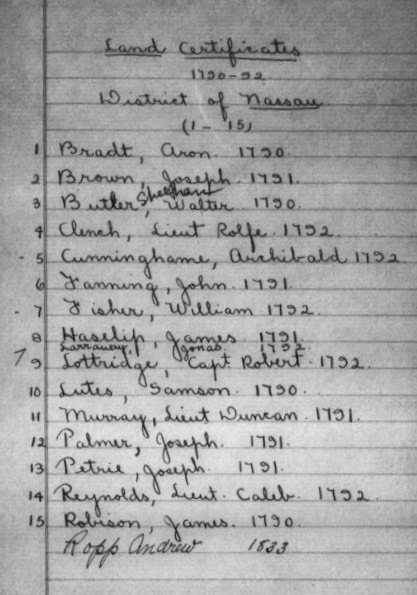 The first thing you need to know is that although the papers have not been transcribed or indexed, there is an index to Loyalists found on Heritage Canada's digitized microfilm C-1475. When you consult this typed index you will see the individual's name followed by a set of numbers as in the example below. Warning: the film is blurry! The 3-digit number is the Volume where you will find the original record, followed by the page number. So in this example above we know that a record for Jonas Larroway is found in all these volumes. Volume 167 for example has 5 pages listed for Jonas. Sounds easy, right? Wouldn't we just go to whatever film holds Volume 167 and then look for the pages? How I wish it were that easy but it's not. There are 43 digitized films for the Haldimand Papers on Heritage Canada but there is no explanation of what is found in each film. A look at Library and Archives Canada also comes up empty. There is nothing found that describes the films and provides a description of each. To complicate things, there are several variations of numbers being used including the Series B transcripts (H-4digits), the Series B transcript volume numbers (B-3digits), the Add MSS 4digits number from the British Library and the WMD film number of the actual papers. It took me quite awhile to figure out that the Volume (V) number is the equivalent to a B number. So in the example above we want to find B-167. But we still don't know what film it is on. I'll share with you that it took me an entire day to figure out what films I needed. 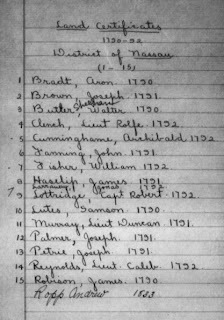 Once I figured it out, I found an impressive set of miscellaneous papers with my ancestors' names receiving rations from the British Government, on Loyalist Muster rolls and more. 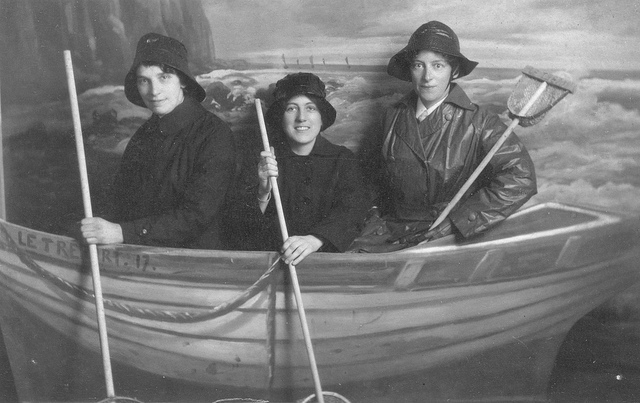 Without further ado, here are the steps you need to take to find your own ancestor! Step 1. Consult the index found on Microfilm C-1475 Four bound volumes of transcripts which relate primarily to Loyalists, together with a typed index have been microfilmed on this reel. The Loyalist volumes in finding aid no. 599 are: Add. MSS. 21765 (B105), 21826 (B166), 21827 (B167), 21828 (B168) and Index. You may find it easier to download the typed index on Collections Canada. It is a PDF file which you can save to your computer. I should mention that you would be wise to avoid looking for any filmed records (other than the index) in C-1475. The C films are very bad quality and are difficult to read, having been filmed in the 1950s. The H films were filmed in the 1980s and are much better quality. You are looking in the B series column and then the LAC reel number. We can see that B-167 is found on 2 films, H-1654 and H-1655. Ignore the 21827 as that is the Add MSS number. The important fact here is that B-167 pages 1 to 320 are found on H-1654 but they will be found at the end of that film, not the beginning. There are other Volumes (B numbers) at the beginning of the film. Then pages 321 to the end were filmed on H-1655. We are only in B-163 and you want B-167 so you will have to scroll quite a bit further. Once you reach your volume (B number) of interest, simply look for the page numbers you want. 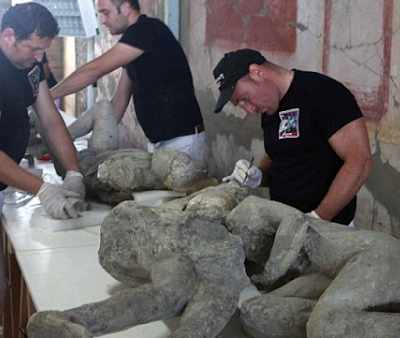 Restorers are currently working on 86 preserved casts of bodies of those who perished when Vesuvius erupted in 79 A.D. 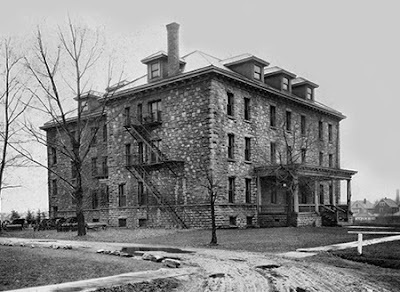 Thanks to the Provincial Archives of New Brunswick, the admission records of the Saint John Almshouse, New Brunswick are online and freely available to all genealogists. The records contained in the St. [Saint] John City Almshouse Admission Registers from 1843-1897 and the Saint John Almshouse Admission Registers, 1843-1884 for individuals admitted to the Alms and Work House, the Emigrant Infirmary, and the St. John Emigrant Orphan Asylum may be accessed by searching or browsing the list of surnames. This is a page (left and right sides) from the Register of the County Alms and Workhouse 1843-1897. Poor Willie McCallister. 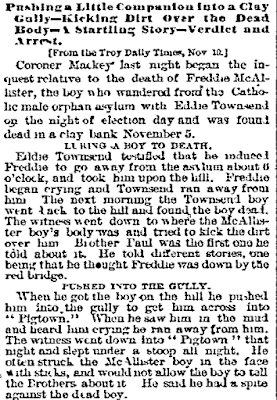 Little did he know that November day in 1885 that his young life would end. 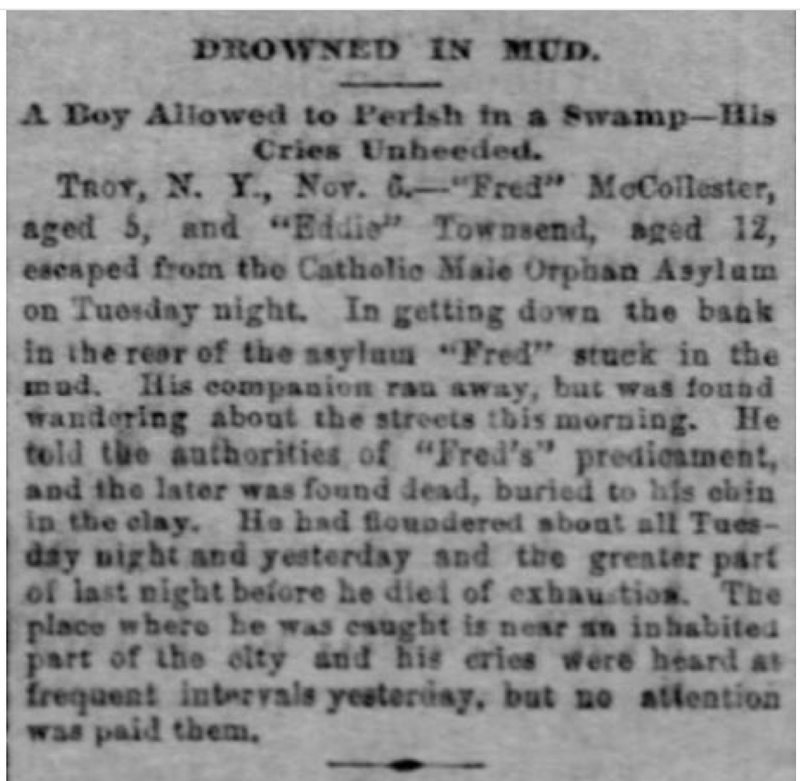 Willie, sometimes called Fred, was 5 years old and living in the Catholic Orphan Home for Boys in Troy New York. 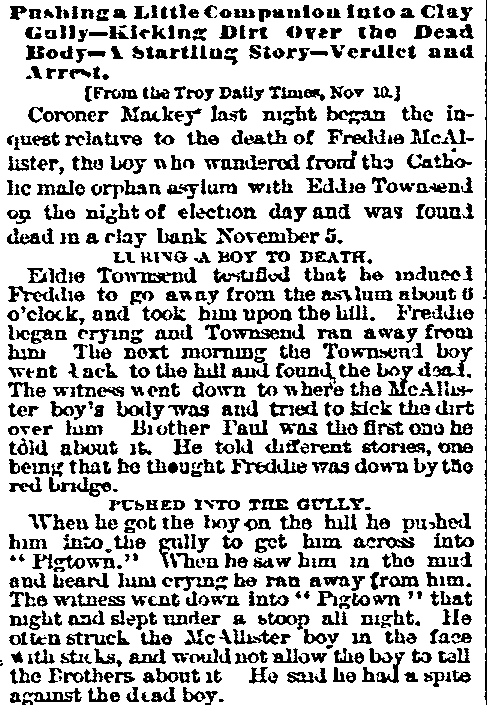 He and an older boy, 12 year old Eddie Townsend wanted to watch the fireworks, so they devised a plan to sneak out and enjoy the show. But young Willie stepped in the muck, made much worse than usual by the rainy weather, and could not get out. He struggled, but sank further into the wet sludge. 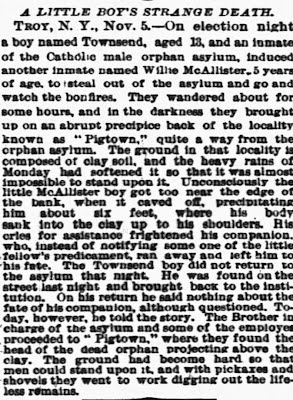 Young Townsend ran off and was found wandering the streets the next day. 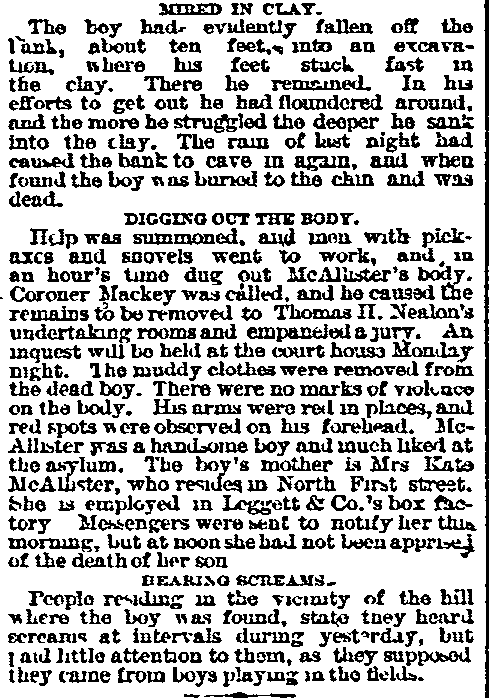 Sadly he did not tell authorities that Willie was trapped until two nights had passed. When he did finally reveal Willie's plight, it was too late. 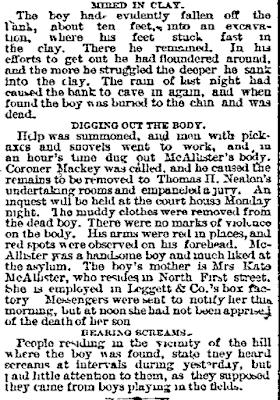 Little Willie was found dead with mud up to his chin. Willie deserves to be remembered and perhaps my readers can help find Willie's family. According to a lengthy article in The Times on November 12th, Willie's mother was Kate McCallister living on North 1st Street and employed at Leggett's Box Factory. Willie was said to be very good-looking and well-liked in the Asylum. He is the perfect example of what is known as a "half-orphan", that is, a child with one parent living but in destitute circumstances. Thanks to visitor Beckie who sent me the Pittsburgh Newspaper clipping and asked for my help. UPDATE! 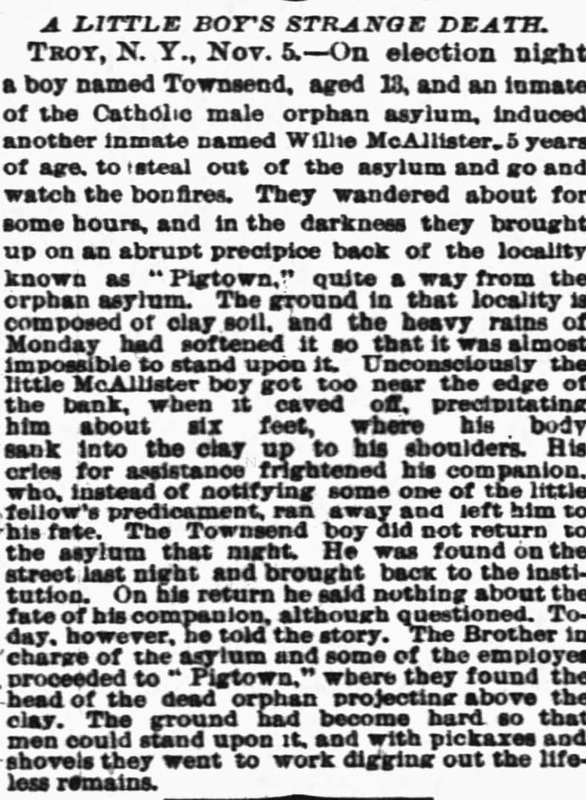 I think I may have found "Willie" and his family in 1880 in Troy New York. 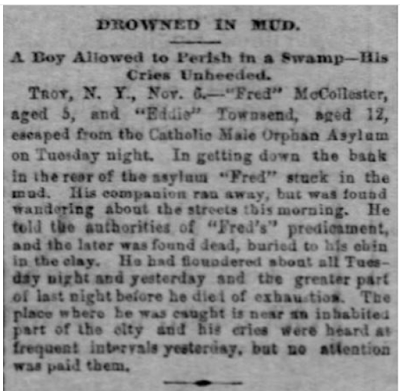 The family consists of Frederick McCallister, age 35, a moulder born in Pennsylvania with wife Katie, age 25 born New York and with children Grace,6 and Freddie, 7months (Freddie would be little "Willie") I am off to hunt for the family in 1900. 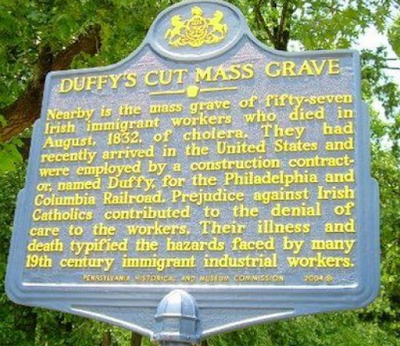 In 1832 the widowed 29-year old Catharine Burns left Tyrone Ireland for America. 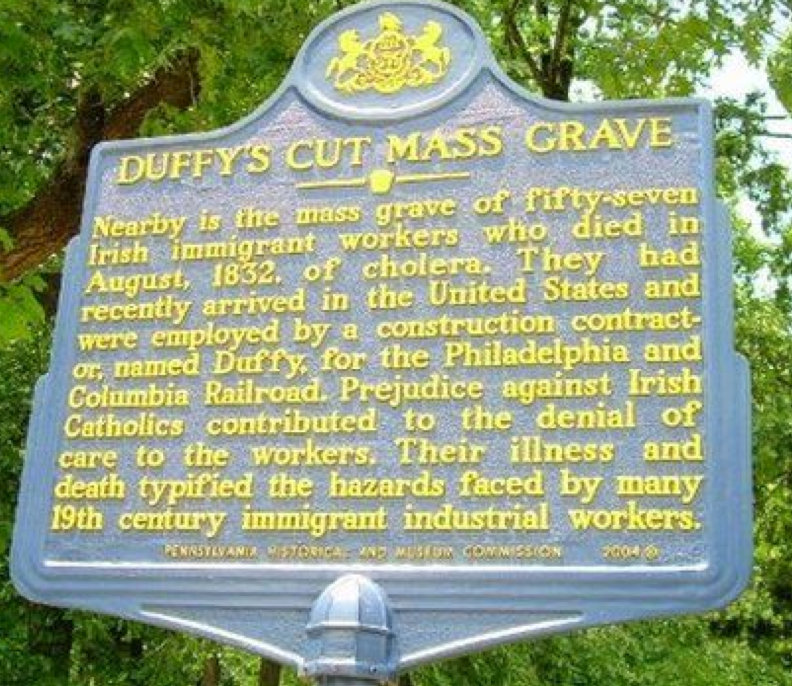 A few weeks after her arrival she was murdered along with other Irish Catholics at Duffy's Cut in Pennsylvania. 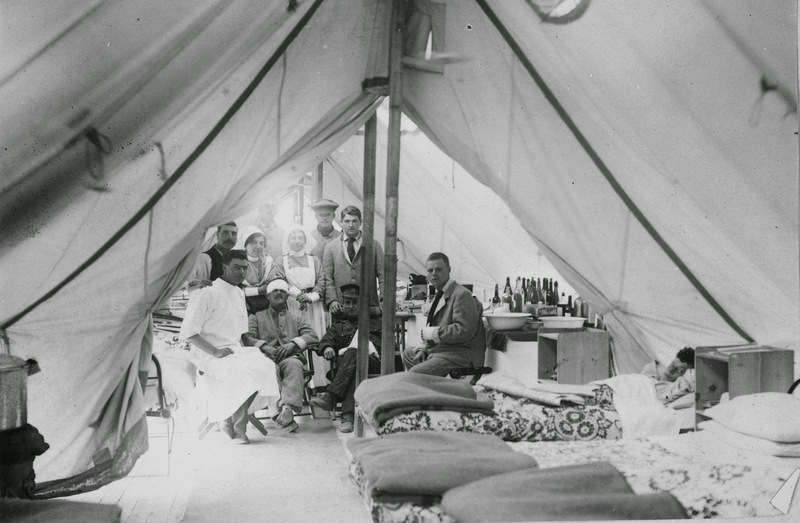 Many of the dead died of cholera but evidence suggests that some were murdered. Blunt force trauma and axe wounds were determined to be the murder victims cause of death. Prejudice against the Irish may have been the cause of the attacks. Catharine's bones were recently discovered and she will be flown back to Ireland for reburial. Sadly her relatives have not been found and all that is known of her is that her father-in-law was John Burns, born circa 1758. He was on the ship with Catharine heading for America in 1832. Previously I talked about the 1851 Agricultural Census and using the online Library and Archives Canada Search Engine to find an ancestor. You can also search on Ancestry.com in their online Canadian Census records. Unfortunately you cannot narrow your search to just bring up results for the Agricultural Census. However when you enter an ancestor's name, IF that person is found in the existing Agricultural portion of the 1851 census, and IF they are found in a surviving 1851 Personal Census, you will see two results. One will be the personal census, the other the Agricultural. If the person is found in one census and not the other, how do you tell which you have? It's simple. The result for the Agricultural census will not display an age. 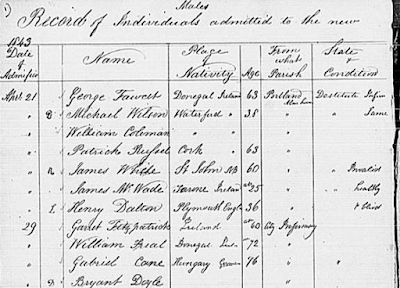 The database you want to search is called 1851 Census of Canada East, Canada West, New Brunswick, and Nova Scotia. Don't enter the individual's age or year of birth. Just search by first and last name, and location. It would make life easier if Ancestry had entered the word "Agricultural" into their database fields so we could narrow the search but they have not done so. However with a little patience you can find your ancestor providing that census has survived for the area the ancestor lived in. Don't overlook this resource as it has great genealogical value to researchers. Is Ancestry.com Being Sold Again? Rumour has it that Permira Advisers LLC, the buyout firm that owns most of privately held Ancestry.com , has hired investment banks to run an auction for the company. You can read more at Reuters. Permira outbid other private equity firms to take Ancestry private in 2012 for $1.6 billion. What's in store for Ancestry and its customers now? We'll have to wait and see if the rumours are true. Previously I talked about the 1861 Agricultural Census for Ontario and the goof that Ancestry.com made when bringing it online. 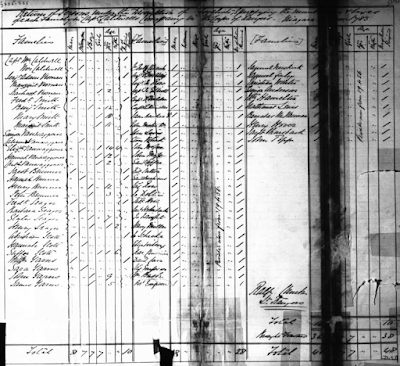 Why search for ancestors in an Agricultural Census? These records provide details of exact location of land, type of farming, house lived in, livestock and more. 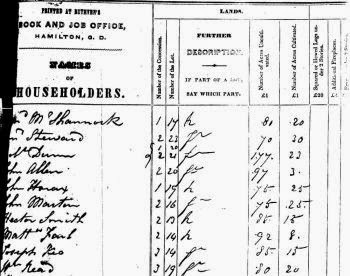 Ancestry.com doesn't appear to have the 1851 or 1871 Agricultural Census schedules (at least they are not easily found!) but there's good news! In 2011 I talked about how to go directly to the Agricultural census on Collections Canada. That was a great database and search engine, much better than the new one on Library and Archives Canada. But it no longer exists. 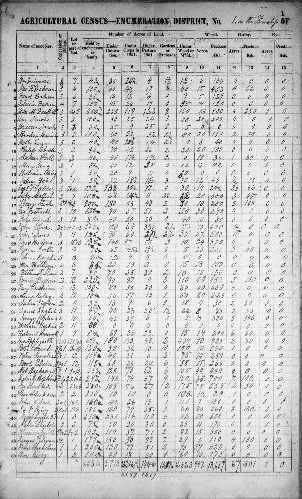 You must now search for ancestors in the 1851 Agricultural census at Library and Archives Canada. 1. Select Canada West (Ontario) from the drop down list for Province/Colony. 2. To narrow your search by township or county (or both) simply add them as keywords. Be very careful using this search engine! It is unforgiving. For example if your ancestor's name was recorded as "Thos." 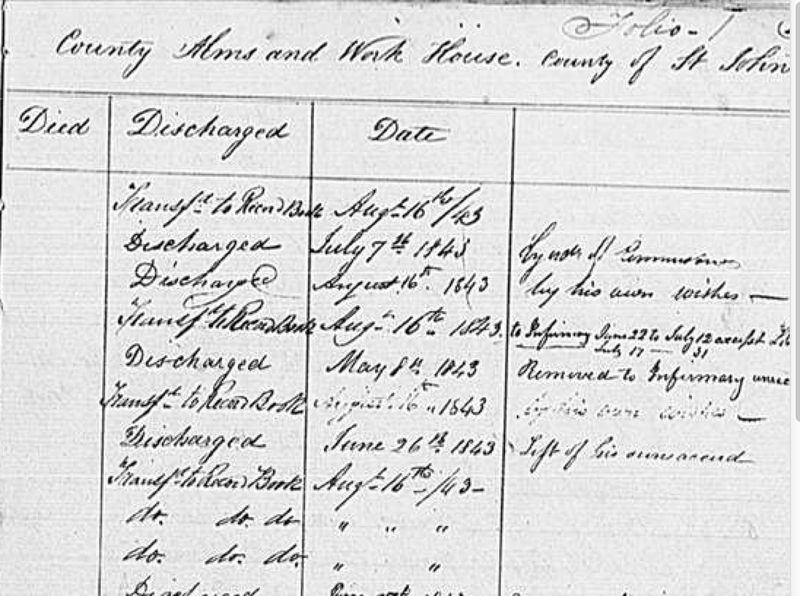 (for Thomas) on the original census page, searching for "Thomas" will give you ZERO hits. It is best to use wildcards, for example "Tho*" allows for abbreviations and full name. I had ancestors in Flamboro Township in Wentworth County in 1851 so I entered keywords "flamboro wentworth" and got 3 hits. Each hit has a list of available images. All I needed to do was start at the first image and begin looking. 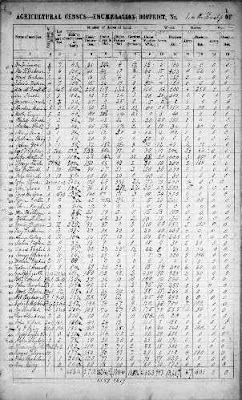 Here's an example of what one page of the 1851 Agricultural Census looks like. The graphic used here is blurry but the original is crystal clear. So don't be afraid to give this a try in your search for more details of an Ontario ancestor. Have You Checked Assessment Records for that Elusive Ancestor? Genealogy records for early Ontario (Canada West, Upper Canada) are challenging to find. They are sporadic and held in different repositories. Some often over-looked pre 1850 records include Assessment Records. These work well as a census substitute and they usually provide an exact location of land (Lot and Concession Number) within a Township. Some give numbers and type of livestock and crops. Assessment records were used to assess individual's property and holdings in order to calculate and collect tax revenue. Not all townships' Assessment Records have survived. Not all townships did assessments for the same years. So if you are looking for these records you will need to find out if your County and Township of interest has any that survived. Organizational Project Part 6: Ready for the Second Sort of Photographs! All my family photos and photos passed on to me after family members passed away have passed the first sort. That means I have tossed blurry photos, set aside photos that I don't want but others in the family might love to have, and put all the rest into the categories I decided on in my original plan. I now have 5 purple acid-free boxes with family photos categorized which cover my life: pre-marriage; marriage #1; marriage #2; marriage #3; grandchildren. I have other boxes for other general categories but for now I'm focusing on these 5 purple boxes. My next step is to take one box and do my second sort within those photographs. I plan on putting the photos into a semi-chronological order, which should make finding duplicates easier. This should also ensure that photos of special events such as birthday parties, vacations and other occasions end up together. Next I will remove duplicates and place them in boxes intended for each of my children. If there are duplicates that I think my nieces, nephews, cousins or other family members would like, I will put those into envelopes to be mailed to them. Once I've completed this sort (the second sort), I could either begin scanning these photos or I can leave them and start on Box #2. I have decided I will finish the second sort on these 5 purple boxes before starting to scan. Will it never end? It seems many web surfers don't understand copyright. When something is published on the internet on a website or a blog, it is copyright to whoever wrote it. It is not up for grabs! I don't know why folks can't grasp that an article I write, for example, and publish here on my blog or on one of my websites, is copyright to me. That means it cannot be published elsewhere without my permission. Think of this way - if you go to a Library and borrow Stephen King's latest book to read, you cannot copy it and republish it anywhere - online or offline, without Mr. King's permission. (which of course he would not give) If you do publish without his okay, even if you clearly state that Mr. King wrote the piece, not you, you can bet your life he will sue your (ahem) off. So why then do some folks think they can come to a website, read something they like and copy and paste it on their own site? That is called COPYRIGHT VIOLATION! And you can be sued. I have copyright notices on every page of my site. Yet some still continue to take my work and republish it as if they are entitled to do so. Some plead innocence when confronted but ignorance of the law is no defense. Some leave the author's name on it and even provide a link to the original website, as if that makes everything okay. But theft is theft and violating someone's copyright is, in my opinion, theft. Many people also confuse plagiarism and copyright. Plagiarism is when someone takes your work and presents it as their own. I've had that happen to me. A genealogist with a weekly newspaper column took an article from my website, published it word for word in a very large American newspaper and put her name as the author. After a thorough investigation, the newspaper fired her. These are serious offenses we're talking about. And I don't back down. If you take my work, I'll pursue every legal avenue available to get you to stop. Copyright violation or infringement is when someone takes work which is protected by copyright laws without permission. What can you do if someone takes your hard work without permission? You can write to the person and demand they remove it. I like to give two options - remove the unauthorized work within 24 hours or pay me a publication fee of $500.00. Those who violate copyright need to understand that an author's work is worth money. If the person isn't compliant, file a DMCA complaint with their website or blog provider. Send the DMCA notice to the person who took your without permission. Don't let it go. We should all protect our work and take what we do seriously. It is not okay for others to do a hit and run with no regard for legalities or respect for the work of others. An antique ship has been found in Toronto Harbour in Ontario Canada. 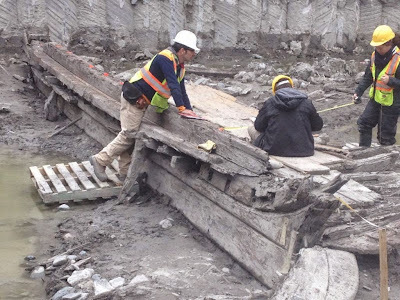 During excavations for a condominium, archaeologists discovered what appears be the remains of a 19th century wooden schooner. Experts believe the ship might be American dating back to the 1830s. We've all seen them. I'm talking about the online Family Trees that are rife with errors. Many genealogists wonder if it is worthwhile writing to the owner of the tree to provide them with corrections. A few weeks ago I conducted an experiment. I found 21 Family Trees on Ancestry.com that had the wrong death date for my great-grandfather Joseph McGinnis. It's actually an easy error to make as the death record is for a different Joseph McGinnis. It was an error I too made many years ago (pre-internet) and one I shared with a few other researchers. When I discovered that it was the wrong man, I wrote to anyone I had previously shared with and told them. So I was taken aback to discover these 21 trees with the wrong death for my ancestor. I decided to write a letter explaining the error and directing the owners to a blog post I wrote going over the facts and clarifying the two Joseph McGinnis males. Here's what I wrote. I deliberately kept it short and to the point. My experiment was to see 1) how many tree owners would respond and 2) how many would correct their error. I should add that I verified that the owners are active and are online every few days. So they have had plenty of time to respond to my note. 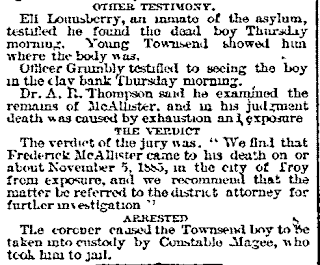 Your death date of 1877 for my ancestor Joseph McGinnis (husband of Fanny Downey) is incorrect. The Joseph who died on that date was a different man. I have documentation to prove this. 6 out of 21 tree owners responded. All responded favourably and thanked me. Did any of them correct the error? 1 owner signed in as recently as today. She has not corrected the error. 1 owner signed in yesterday. His tree is now private. 1 owner removed the incorrect date. She is a woman I have also corresponded with many times over the past 16 years. 1 owner told me had made the correction. He has not. His online tree still shows the same error. I hate to say this but the time it took me to write to each of these people and then read and respond to those who responded, was not worth my time. 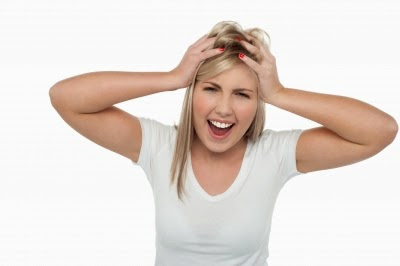 It irritates me to see bad or incorrect genealogy perpetuated but from now on I am going to grit my teeth and spend my time on other more worthwhile genealogy pursuits such as bringing more free genealogy records online to Olive Tree Genealogy website! Did Your Ancestor Disappear from the Records? 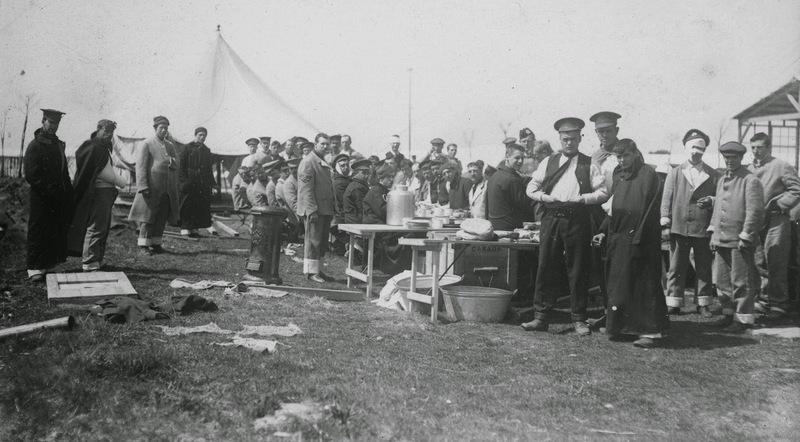 Eight Canadian First World War soldiers will be buried on May 13 at Caix British Cemetery in Caix, France. The soldiers, from Winnipeg’s 78th Battalion, were found in 2006 and 2007. A few were identified - Lieutenant Clifford Neelands, Lance Sergeant Oscar Lindell, and Privates Sidney Halliday, William Simms, and Lachlan McKinnon. Continue reading this story at Eight Canadian First World War soldiers to be buried on May 13 in France. AncestryDNA Soon Available in Canada!